We’re so excited to interview Kathryn Sollmann on the Path Forward blog today. Kathryn is an author and speaker who keeps women working toward financial security, alongside child and aging parent caregiving. She co-founded one of the first companies to help women return to work. In her upcoming book, “Ambition Redefined: Why the Corner Office Doesn’t Work for Every Woman & What to Do Instead,” she calls for no-apologies independence from the “lean in,” “break the glass ceiling” mantra. In this two-part interview series, she shares her valuable insight on restarting your career and financial security. What is the biggest mistake you see women making when attempting to restart their careers? In all the years I’ve worked with women on hiatus from the workforce, I’ve seen a pattern of waiting, waiting and then waiting even longer to jump back in. There are a few reasons for this delay. Women have a tendency to think that “work” means returning to an all-consuming major league “career,” rather than what could be an interesting, professional, lucrative, flexible “job” that would fit more easily into their complex lives. Women stay out of the workforce an average of 12 years—and 12 years ago there weren’t as many opportunities to work in a flexible way. They remember the traditional corporate grind they chose to leave behind but don’t realize there are actually six different kinds of flexwork—including a full-time job with flexible hours. When they were going full steam ahead toward a hard-driving career, they were probably fresh out of college or graduate school, maybe unmarried and probably without the responsibilities of children and aging parents. A career or ardent professional passion—with all the strategic and political moves to rise up the corporate ladder—is optional. In my book (literally and figuratively!) what is essential is some kind of work that fits life—for financial independence, long-term security and the ability to fund all of life’s “you never knows.” Don’t delay—get back in! In your experience how does money factor into a woman’s decision to return to work? How should a returnee look at money and compensation in her decision to return to work, even if it’s not as much as she was previously making? It indeed makes long-term sense for women to earn a professional salary of any size: to invest valuable time into future earning power, build resumes, expand their portfolio of marketable skills, and earn money that can be invested and saved. Women who have “all or nothing” attitudes about high compensation aren’t thinking broadly about saving and investing. Financial advisers tell me that many well-educated women don’t consider how the power of compounding increases even a small savings over time. In my book I give an example of a woman who returns to work at age 45. She doesn’t want a big corporate job, so she takes a flexible, part-time (20 hours per week/$25 per hour), mid-level job during school hours at a small local firm. I won’t get into all the specific calculations here, and to keep things simple, I assume she works for 20 years and her compensation stays the same. She’s able to save and invest all her take-home pay, and by age 65 she’ll have savings of $519,000. That’s more than half a million dollars in savings from a moderate-stress job during school hours and close to home. This is just a very conservative example—many returning professional women will earn at a higher level and opt for flexible full-time work. But in any scenario, it doesn’t take a high six-figure salary to make work worth it! Thanks so much for your advice Kathryn! Kathryn will be back next week with Part 2 of her interview. 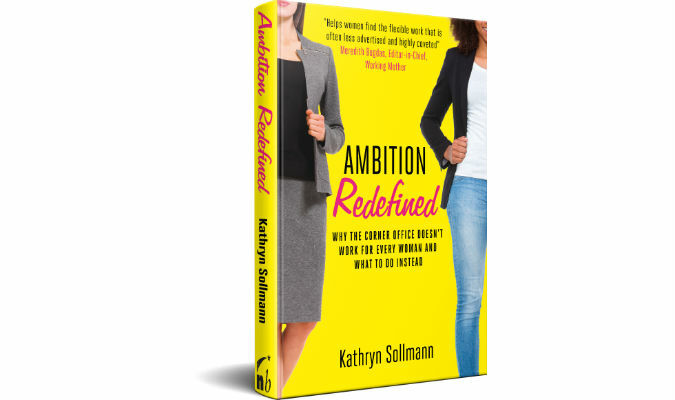 Kathryn Sollmann is a career coach, speaker and author of the book, “Ambition Redefined: Why the Corner Office Doesn’t Work for Every Woman & What to Do Instead.” Path Forward will be at Kathryn’s Book Launch and Networking Event at Barnes & Noble 5th Avenue in New York City. Join us! Thanks a lot for this post, am a mom of two and have done a lot of search on jobs that allow one to work at home but to no avail, all have ever stumble on are a scam.